Case Study: Clarion Consumer Research — Modera Inc. Since 2012, Modera has provided a broad array of agency services for Clarion Corporation of America, a leader in consumer and commercial automotive systems. A majority of Clarion’s business is through Original Equipment Manufacturer (OEM) contracts, and Modera routinely conducts consumer research to aid presentations for contract renewals and new business. Modera’s goal was to gather public opinion on various automotive safety technologies and Clarion products. From advanced haptics or biometric technology, to audiovisual and safety systems, Modera aids Clarion in marketing such technologies to major car manufacturers. 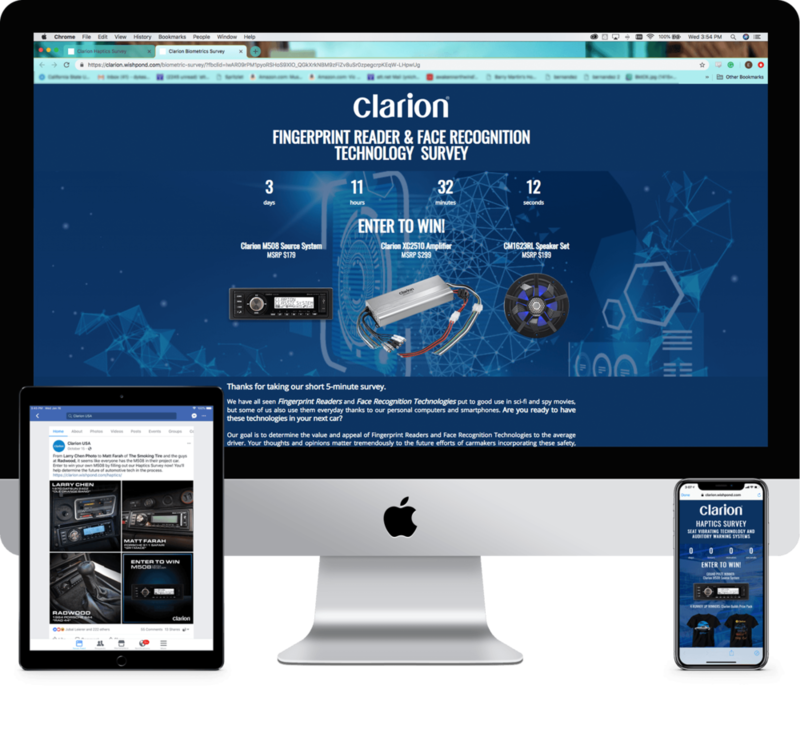 After building a website to showcase Clarion’s burgeoning technologies, Modera used social media advertising, influencer partnerships, and product giveaways to market Clarion survey pages to thousands of relevant consumers. Below we highlight the digital process, where utilizing car influencers and contest giveaways helped us gather relevant leads, above and beyond our target of 500 leads per survey. What attitudes have Clarion consumers formed about different technologies and their competitors? What do consumers like and dislike about safety and entertainment technology in their current vehicle? How much would consumers be willing to pay for various technologies in a future car purchase? To market survey pages, Modera utilized Clarion USA’s social audience (600K+), re-marketing lists, influencer partnerships, and Clarion product giveaways as incentive for entering. Each survey produced better results, thanks to relevant re-marketing lists, and every survey produced at least double (sometimes 4x) the target amount of leads. By targeting relevant interest groups and re-marketing lists, Clarion Facebook and Instagram Carousel Ads and Instagram Stories converted a high percentage of social audiences. Each survey incentivized users with Clarion prizes like source units, speakers, or branded T-Shirts. Clarion social media partners and automotive influencers like Matt Farah and Larry Chen (2M+ combined reach) motivated new groups to participate by sharing images of their own Clarion product. This strategy captured new leads for consumers interested in Clarion products, and conversion rates for each survey averaged 60% with the highest at 97%. Future campaigns also utilized these lists for marketing Clarion product.